Starz announced today that Black Sails has been renewed for a second season, six months before the first season debuts in January 2014. Plus, the network has launched a website for The Nation of Thieves at Pirates-Wanted.com, where fans can sign up to be a part of this fictional pirate crew. Take a look at the video with fans from all walks of life at Comic-Con 2013 showing their allegiance to the pirate life, then read the official press release for more details regarding this upcoming series. Starz Chief Executive Officer Chris Albrecht announced that the network has picked up a second season of the original series, Black Sails from executive producer Michael Bay in advance of its first season premiere. The announcement comes on the heels of the exclusive fan screening at San Diego Comic-Con several months in advance of its on-air premiere in January, 2014. 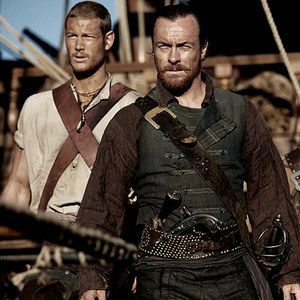 The eight-episode first season of the authentic pirate adventure centers on the tales of Captain Flint (Toby Stephens) and his men, and takes place twenty years prior to Robert Louis Stevenson's classic "Treasure Island." Black Sails is executive produced by Michael Bay (Transformers, Armageddon, Pearl Harbor) and his Platinum Dunes partners Bradley Fuller and Andrew Form, producers on The Purge and currently in production on Teenage Mutant Ninja Turtles. The series was created by showrunner and executive producer Jonathan E. Steinberg (creator Jericho, Human Target) and Season Two executive producer Robert Levine (Touch). The production is set to begin on the 10-episode second season at Cape Town Studios in Cape Town, South Africa in November. Here's what Chris Albrecht had to say in making the announcement. "Michael Bay, Jon Steinberg and their teams delivered a spectacular first season of Black Sails, and we are incredibly proud of everyone's work. Based on the strong fan response to the preview screening at last week's Comic-Con, we felt an early order for a second season would allow the writers, cast and crew enough time and space to continue crafting such unique and epic storytelling." Creator and Executive Producer Jon Steinberg had this to say in his own statement. "We are thrilled to be receiving such an exciting vote of confidence from everyone at Starz and for the opportunity to carry the Black Sails adventure into season 2 without missing a beat. We couldn't ask for better partners in bringing our pirate world to life." Executive producer Michael Bay released his own statement regarding the renewal. "We've had a fantastic experience working with Chris Albrecht and Jon Steinberg. Brad, Andrew and I look forward to continuing our partnership with Starz on future episodes for this extraordinary show." Flint, the most brilliant and most feared pirate captain of his day, takes on a fast-talking young addition to his crew who goes by the name John Silver (Luke Arnold). Threatened with extinction on all sides, they fight for the survival of New Providence Island, the most notorious criminal haven of its day - a debauched paradise teeming with pirates, prostitutes, thieves and fortune seekers, a place defined by both its enlightened ideals and its stunning brutality. Toby Stephens (Die Another Day) and Luke Arnold (Broken Hill) are joined by Zach McGowan (Shameless) as rival Captain Charles Vane; Toby Schmitz (The Pacific) as Jack Rackham, Vane's right hand; Hannah New (Maleficent) as Eleanor Guthrie, a determined young woman who runs the smuggling operation on New Providence; Hakeem Kae-Kazim (Strike Back, Hotel Rwanda) as Mr. Scott, Eleanor's retainer and right hand, Jessica Parker Kennedy (The Secret Circle, 50/50) as Max, a tortured young prostitute who sees the dark side of New Providence; Mark Ryan (Transformers, The Prestige) as Gates, Captain Flint's Quartermaster and most senior member of his crew, Clara Paget (Fast & Furious 6) as the beautiful but cold-blooded Anne Bonny and Tom Hopper (Merlin) as Billy Bones, boatswain of Flint's ship.